Promoted: Sevenoaks launches interactive magazine | What Hi-Fi? So, you’ve made the decision to revamp your entire set-up. Or maybe you just want a radio for the kitchen. Whatever level you’re at, you will, of course, already have thumbed the pages of What Hi-Fi? magazine. You’ll have trawled the website. And you will have armed yourself with all the knowledge you need to kit out your living room with the perfect set-up. Now what? 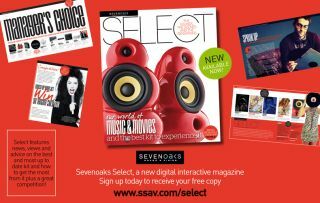 Sevenoaks can help with Select magazine – an interactive digital mag that aims to help you get the most from your hi-fi and home-theatre equipment. Its 68 pages are full of information on kit that the people who run the show would jump at the chance to have in their own homes. And, of course, it’s interactive – so expect plenty of extras including video and photo galleries. And this isn't just another dealer mag. Sure, you'll find great products – but you'll also get great information. The sort of thing you want to read about. Whether that's on setting up your kit, new tech news or what the deal is with 4K, Select covers it. You’ll also have the chance to win a fantastic Arcam Solo Bar, worth £799. To receive the first issue free of charge, just click here.